The more games Dak Prescott wins, the more likely the Cowboys are to give him a franchise-crippling contract extension. • Panthers at Falcons: The Eagles already essentially have a two-game leg up on the Falcons, if you count their head-to-head advantage on them. Still, that is a team that has played them tough in Philly each of the last two seasons. There seems to be something about the Seahawks/Falcons defense that keeps the Birds in check. The more losses the Falcons pile up, the better, in my view. Meanwhile, the Panthers are a team that is missing both of its offensive tackles, which would make them extremely vulnerable to the Eagles' pass rush. That's a matchup that should heavily favor Philly Week 7. • Vikings at Packers: I'm torn here. On the one hand, the Vikings are more likely to have a better record when the regular season is all wrapped up, and they'll be more likely to challenge the Eagles for home-field advantage. The Vikes would certainly be more of a problem if a playoff game were played in Minnesota than they were last year in Philly. On the other hand, the Eagles have a huge matchup advantage with their defensive line against Minny's offensive line, and I think they'd handle them either way. And then there's the Packers, who have Aaron Rodgers, and not much else, though Rodgers has shown repeatedly that he can win playoff games on his own. It's probably better for the Eagles if the Packers just don't qualify for the playoffs at all, because Rodgers makes them such a wildcard. • Browns at Saints: Obviously, if the Saints get knocked off by another crappy team after losing to the Bucs Week 1, that would put them in a big hole. • Colts at Redskins: The Skins looked legit in their Week 1 game, albeit against the garbage Cardinals. The Colts probably won't pose much of a challenge either, but obviously, the Eagles would like to like to leave the rest of the NFC East in the dust as quickly as possible, and a Redskins loss would help. • Cardinals at Rams: The Cards are a cupcake matchup for the Rams. Clearly the better outcome would be if they could pull off an upset, but don't hold your breath. • Lions at 49ers: The 49ers are a team that the Eagles could easily handle if they snuck in to the playoffs, as opposed to, say, Aaron Rodgers and the Packers. The more games they win, the better. Also, the more games the Lions lose, the better, as they would represent one more team drafting ahead of the Cowboys or Giants, who I believe will both lose a lot of games this year and could have high draft picks. 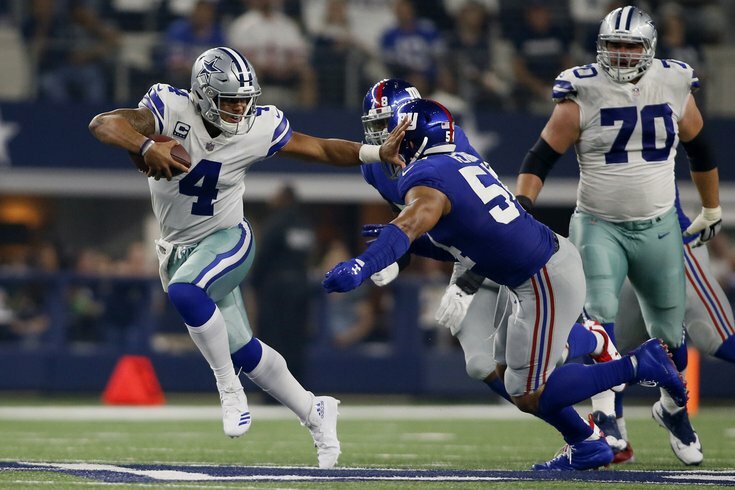 • Giants at Cowboys: We covered this in a mailbag on Thursday, but in my view, neither team is a threat to win the division, so ideally you want each team to win some games to avoid having one of them picking in the top 5 of the 2019 NFL Draft. The ideal scenario for an Eagles fan would be if Dak Prescott has enough positive moments this season where the Cowboys talk themselves into him as their long-term answer, and sign him to a huge franchise-crippling contract extension. No such thing is going to happen with the Giants and Eli Manning, presumably (though I can’t fathom how they still think he’s an answer even in 2018). So I think you want the Cowboys to win, with Dak shredding the Giants defense. Cowboys fans will be annoying for a week if that happens, but it’ll be worth it in the long run. • Seattle at Chicago: Like with the Niners above, the Bears are a team the Eagles could easily handle in the playoffs, should they make it there. The more games they win, the better. We'll also note the Eagles got a good result on Thursday night when the Ravens lost to the Bengals, as the Eagles own the Ravens' second-round pick in 2019.